Country superstar Carrie Underwood, along with the Arista Nashville team, pulled out all the promotional stops last fall to launch her fifth studio album, Storyteller. That extra effort had a happy ending when Storyteller was certified gold by the RIAA in just six weeks. MusicRow sat down with Underwood and members of the Arista Nashville promotion team—including VP, Promotion Lesly Simon, National Promotion Director Andy Elliott, and Regional Promotion Manager Lauren Thomas—to discuss the strategy behind the radio release of “Smoke Break,” as well as the role country radio has played in her career thus far. 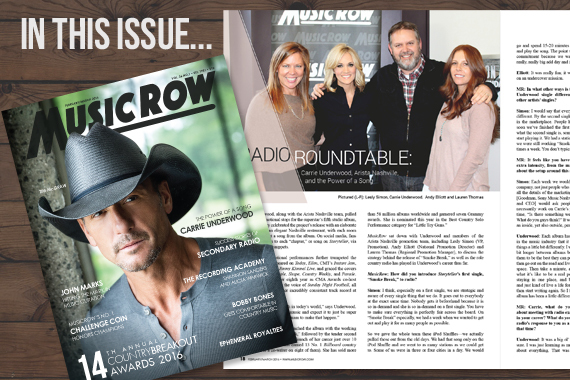 For the full interview, pick up MusicRow’s CountryBreakout Awards issue, or receive your copy when you subscribe to MusicRow. MR: How did you introduce Storyteller’s first single, “Smoke Break” to radio? Simon: Especially on a first single, we are strategic and aware of every single thing that we do. It goes out to everybody at the exact same time. Nobody gets it beforehand because it is so in demand and she is so in demand on a first single. You have to make sure everything is perfectly fair across the board. On “Smoke Break,” especially, we had a week that we wanted to get out and play it for as many people as possible. So we gave the whole team these iPod Shuffles—we actually pulled those out from the old days. We had that song only on the iPod Shuffle and we went to as many stations as we could get to. Some of us were in three or four cities in a day. We would go and spend 15-20 minutes with a station and play the song. The point was to get their commitment because we wanted to have a really, really big add day and it all paid off. Elliott: It was really fun; it was like we were all on an undercover mission. MR: With the setup for Storyteller, it feels like you approached it with extra intensity, from the marketing to the radio push. Talk about the setup, both from a promotional perspective and from the artist’s perspective. It’s a mix of creativity from every single department. Carrie was awesome and worked with us every step along the way, and Ann worked with us. Carrie has an incredibly rabid and active fan base and they were so hungry to have this music. What kicked it off was this surprise announcement. When she teased that the announcement was coming, we then had all the radio stations get on board and they teased that the announcement was coming. That was all done at 4 p.m. on a Thursday afternoon. Radio was on board. She made the announcement on-air and on Facebook at the same time. It was a great way to have appointment listening for their listeners. From there it kind of just took off. Underwood: Each album has its own time in the music industry that it lives in. I do things a little bit differently. I wait just a little bit longer between albums, just because I want them to be the best they can possibly be and then go out on the road and live in one album space. And then I’ll take a minute, and remember what it’s like to be a real person, staying in one place, and being married and just kind of live a life for a second and then start writing again. So I feel like every album has been a little different. Thomas: That speaks to you [Underwood] as an artist. The country fan base is based on faith and family and that’s exactly who you are. That’s why country radio has continued to be incredibly supportive. Elliott: When a piece of music [like Storyteller] gets turned in that is at that level, everybody has to rise to that level to give it what it deserves. I think every department at Sony dug in and came up with super creative things. Obviously the results speak for themselves. MR: Carrie, how would you describe your working relationship with the Arista promo team? Underwood: I’ve known this one [Lesly] for a long time. I know everyone is part of the team and is going to do their job well. We have an openness to communicate and give our thoughts and opinions and feelings on things. We have a level of trust that has gotten stronger over the years. MR: Your career is multi-faceted now, with hosting the CMA Awards and releasing a fitness apparel line. How important is country radio at this stage of your career? Underwood: You can’t have all the other stuff without radio. They play an undeniable role. You can make all the albums you want to make and all the music you want, but if nobody hears it, does it matter? They play such a huge part in everything—my entire career, not just in music. MR: Carrie’s career at radio has been consistent and steady, from “Jesus, Take The Wheel” to now. Why do you think you have maintained such a high level of interest at country radio from the very beginning? Underwood: I always try to have something going on, even between albums. I’ve been lucky enough to be part of other people’s albums. It’s always nice to have some music and be lucky enough for people to still be interested 10 years later. Simon: Since the very beginning, she takes each album and does a tour and there is a whole time frame that goes around that album, and she allows it to breathe. Then she goes and has a normal life and then creates a new project. Instead of churning out another album, there are phases and stages and steps you go through. You grow as an artist and grow as a person. We never had that place where we get a new album and think, ‘Oh God, that sounds just like the last one.’ It’s always fresh and new and we can’t wait to get it out there.